Georgia’s International Cherry Blossom Festival Coming This March! Georgia’s International Cherry Blossom Festival will bring a series events to Macon, Georgia, during March, to celebrate the beauty of a pink and white-blossomed tree that symbolizes springtime in the United States. Beginning on March 1st, Macon will host several contests, concerts, and plant sales – among other fun things activities – in honor of the beloved cherry blossom. 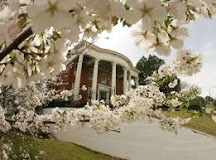 Macon, Georgia – according to Congressional Records – is considered the Cherry Blossom Capital of the World. Every March, more than 300,000 Yoshino cherry trees burst with blossoms that seem to turn the city into one big cottony paradise. Cherry Blossom Festivalgoers will get to experience the spectacle as they participate in events meant to promote fellowship and city pride. The International Cherry Blossom Festival is one of the top flower events in the United States, one of the Top 20 Events in the South, and one of the Top 100 Events in North America. Since it began, 56 years ago, it has enhanced the lives of citizens living in Macon and gathered locals in a sense of civic pride. As a secondary mission, the Georgia International Cherry Blossom Festival has always sought to share the quality of life and community spirit of Macon with visitors, as residents welcome guests to come join them in fun Festival festivities. The Festival’s humble beginnings allowed for a three-day celebration, but today the Georgia International Cherry Blossom Festival lasts the entire month of March and it includes hundreds of events for all ages and backgrounds. The Yoshino cherry trees in Macon keep growing in numbers as the Fickling Family Foundation continues to donate thousands of trees to Macon-Bibb residents annually. This generosity keeps the floral abundance flowing and makes it possible for the beauty of the cherry trees to be enjoyed by locals and tourists year after year. This year, the Georgia International Cherry Blossom Festival will include a Youth Photography Contest, Ceelo Green Concert, Indigo Girls Concert, Master Gardener Plant Sale, Pink is the New Green Cherry Blossom Event, Cherry Blossom Men’s and Senior’s Golf Tournament, Cherry Blossom Road Race, Lantern Lighting in 3rd Street Park, and Cherry Blossom Organ Night, among other events. To find out more about the Festival, visit the Georgia International Cherry Blossom Festival’s website. Georgia's International Cherry Blossom Festival Coming This March! Georgia’s International Cherry Blossom Festival will bring a series events to Macon, Georgia, during March, to celebrate the beauty of a pink and white-blossomed tree that symbolizes springtime in the United States. Beginning on March 1st, Macon will host several contests, concerts, and plant sales – among other fun things activities – in honor of the beloved cherry blossom.Macon, Georgia – according to Congressional Records – is considered the Cherry Blossom Capital of the World. Every March, more than 300,000 Yoshino cherry trees burst with blossoms that seem to turn the city into one big cottony paradise. Cherry Blossom Festivalgoers will get to experience the spectacle as they participate in events meant to promote fellowship and city pride.